Oddly enough, this recipe started with a diet. It was New Year’s Eve, and I was purging the refrigerator so Tom and I could attempt yet another diet. 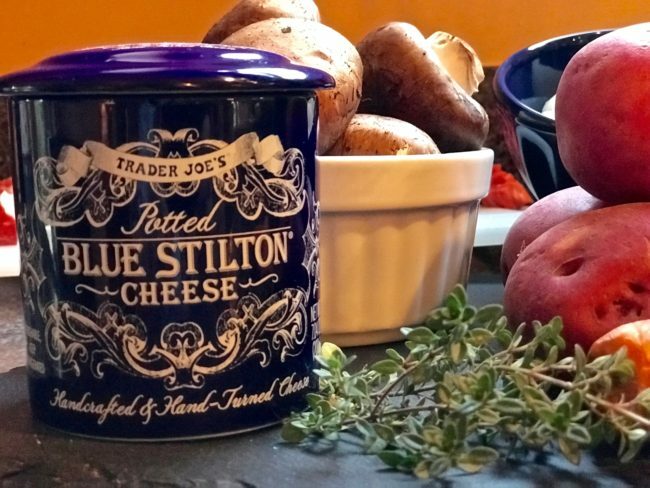 I had a lovely blue jar of Trader Joe’s Blue Stilton Cheese and recalled a recipe I had seen in a Williams Sonoma catalog for a Beef and Stout Pie with a Stilton Pastry top. Be warned. This recipe does take some time: three hours for the stew to simmer, an hour for the pastry to be refrigerated before rolling it out, and then more refrigeration after that. 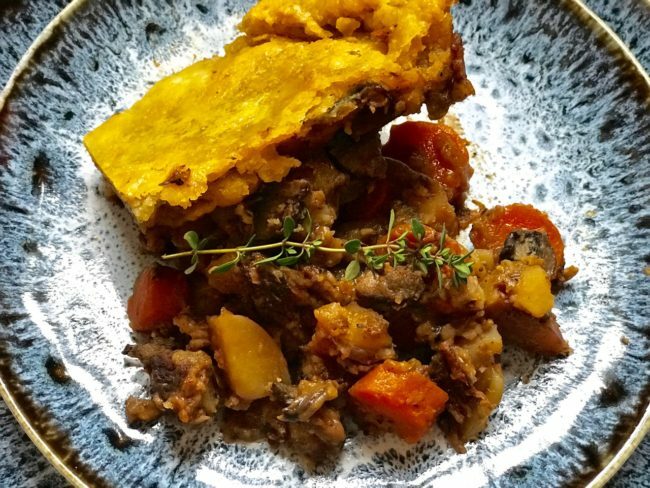 Of course, I didn’t notice these small details until late in the afternoon, so we didn’t get to eat until nearly 9 p.m. Read the recipe thoroughly, twice! The original recipe serves 8-10 people. I made a half recipe which filled up my 5-quart Dutch oven nearly to capacity (and gave us plenty of leftovers). Not sure I could have squeezed the entire recipe into that pot. 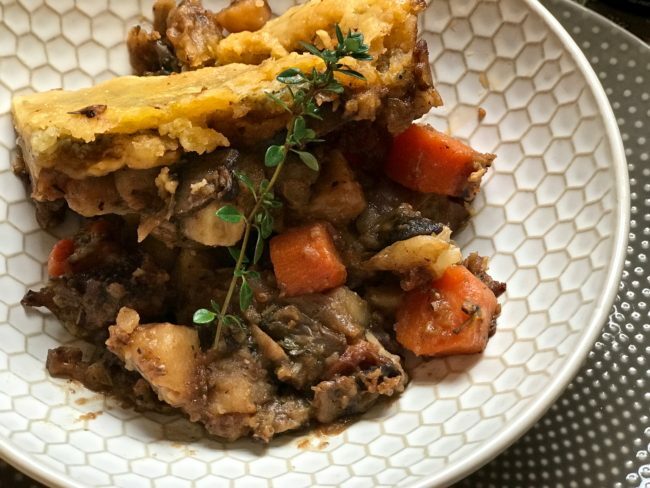 The recipe below is for 8-10 people. 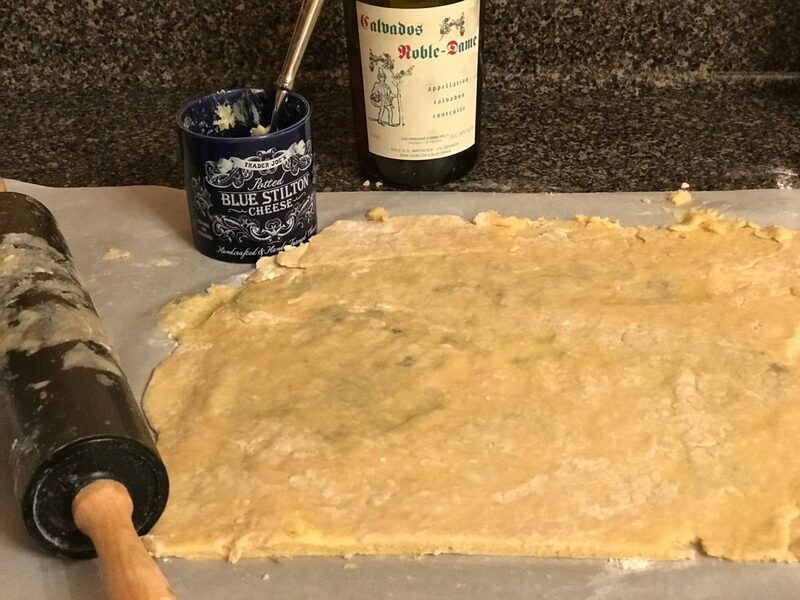 For the pastry top, my friend Mary suggested I replace the ice water with alcohol using any flavor that would enhance the recipe. Mary says she never uses water and she likes to use vodka or limoncello in her fruit pie crusts. We had a bottle of Calvados (apple brandy from the Normandy region in France) on hand, which I thought would pair well with the Stilton, so in it went. The original recipe includes instructions for making the pie crust with a food processor which I do not have. I went old school with two forks to blend the dough. One other tip from Mary is to be sure your butter is ice-cold. 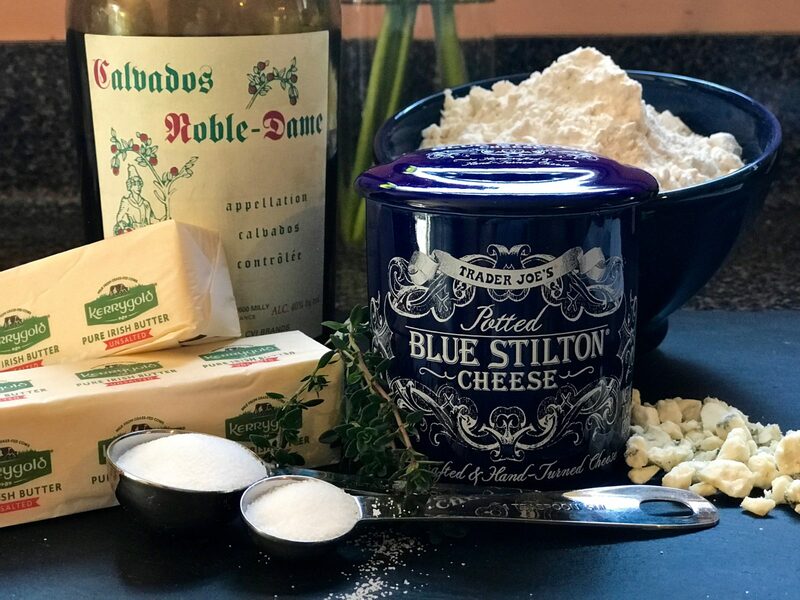 She says that if she has time, she will toss the cut butter pieces with the flour mixture and return the bowl with the flour and butter to the refrigerator overnight. This process works exceptionally well if you are baking something first thing in the morning. Unfortunately, my pie crust does not look as lovely as the Williams Sonoma catalog because it sort of sagged down onto the stew but it still tasted fabulous. 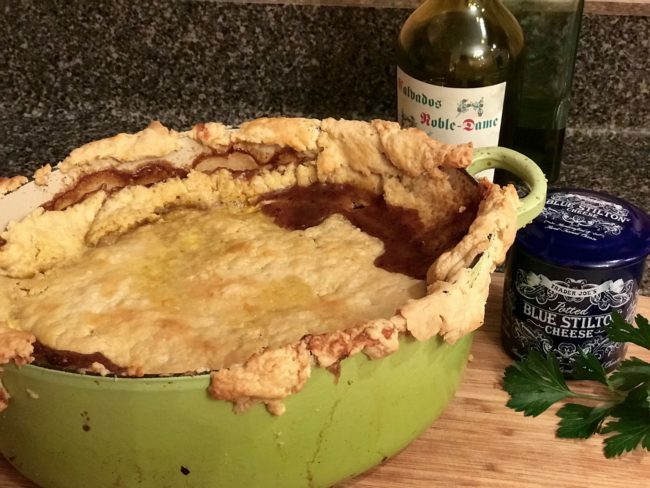 (My friend Donna said it was “artisanal.”) For easier cleaning, be sure to put a foil-lined cookie sheet underneath the pot while baking to catch any pieces that may fall off. The recipe calls for Irish stout. 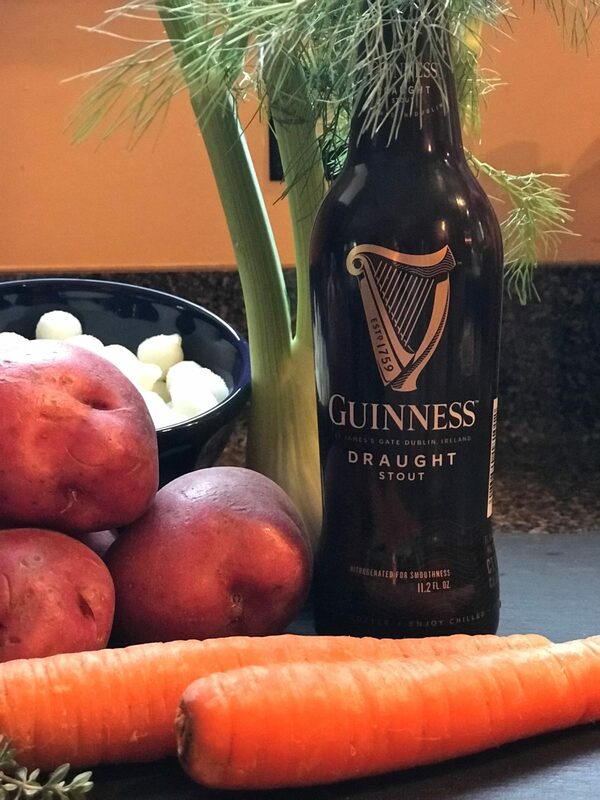 A quick shout-out to our resident Irish stout expert Kim who determined that Guinness Draught Stout was what the recipe needed. 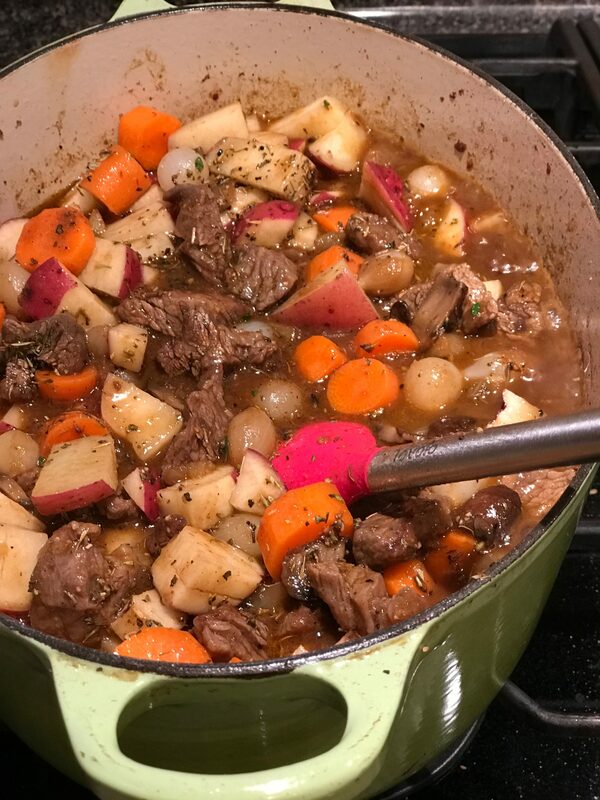 A couple of other tweaks (fennel and herbs de Provence), and man is this a good stew! It can be served with or without the pastry top if you don’t want to go to the effort of making the pastry. I have to admit that making the pie crust was more of an effort and mess than I usually like, but it was totally worth it. 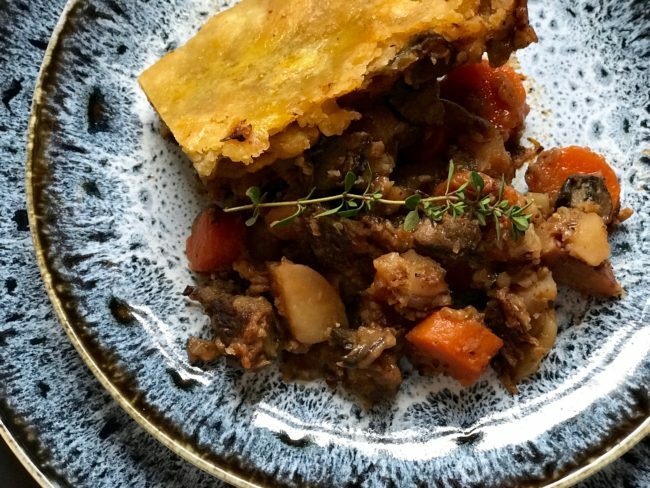 For a true British Pub Supper, add a side of peas! 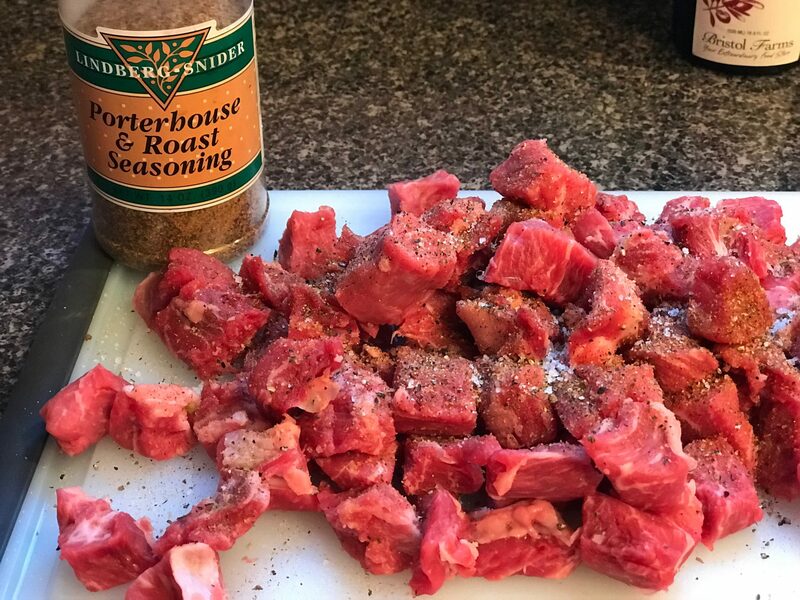 Liberally season the beef cubes with Lindberg Snider Porterhouse & Roast Seasonings, salt and coarse ground black pepper. Put the flour into a 1-gallon zip lock and add the seasoned meat. Shake well to coat all of the meat cubes. Heat 1 T. olive oil in a 5 1/2 quart Dutch oven or similar oven safe pot over medium-high heat. 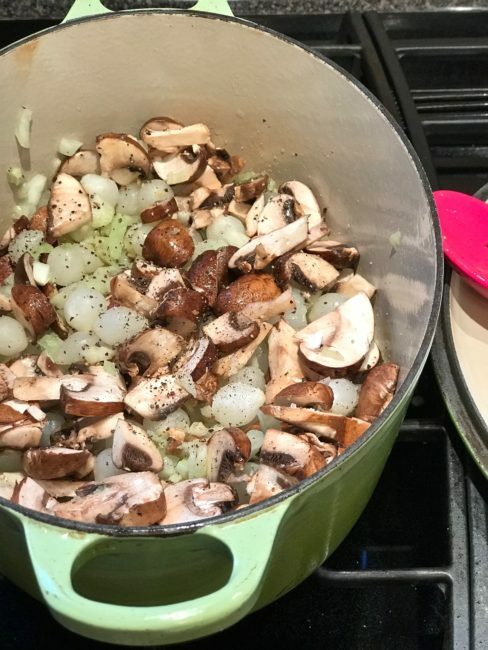 Add mushrooms, onions and fennel, season with a pinch of salt and a couple of grounds of fresh ground pepper. Sauté for about 12 minutes until just softened. Remove veggies from the pot to a bowl. In the same pot, over medium high heat, add 2 T. olive oil. Working in batches, brown the meat for about 7 minutes. Do not over crowd your pot so that you get a nice sear on the meat; remove to a plate or bowl after each batch. It took me three batches to cook the meat. Add extra olive oil as needed. When finished browning the meat, return the pot to medium high heat. Add tomato paste and garlic and sauté for 30 seconds scraping up the browned bits from the bottom of the pan. Add beef, stout, beef broth and any liquid from the beef plate back into the pot. Stir in the mushrooms, onions, fennel, carrots, potatoes, thyme and herbs de Provence. Bring to a boil. Cover and simmer over low heat, stirring occasionally, for 3 hours. Whisk the flour, salt and sugar together in deep mixing bowl or food processor. Add the cold butter and process with a food processor or mix with two forks until it resembles coarse meal. 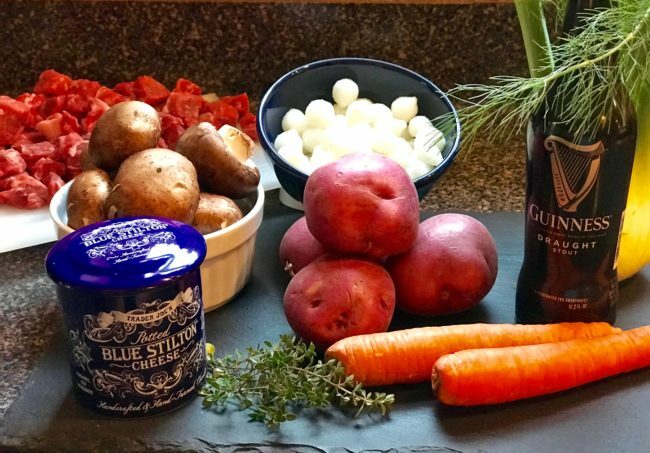 Add the Calvados starting with 1/3 c. and pulse or mix with your forks. Add more liquid, 1 tablespoon at a time, until the dough is no longer crumbly and holds together when squeezed with your fingers. Shape the dough into a disk and wrap tightly with plastic wrap. Refrigerate for one hour. Remove the dough from the refrigerator and let stand 5 minutes. Lightly dust a large piece of parchment paper with flour. Lightly sprinkle the top of the dough with flour and roll it out onto the parchment paper into a 12” x 16” rectangle. Sprinkle the cheese on one half of the dough. Fold the other half over the cheese. Roll the dough into a 16 ½” square and use a paring knife to trim the dough into the shape of your pot (mine was oval). Place the dough on the parchment paper onto a baking sheet and refrigerate until firm, at least 10 minutes. Preheat oven to 400°F. When the pastry is ready, brush the rim of the pot with water. Carefully lay the pastry on top (good luck!) letting it drape over the sides and sag a bit in the middle so it hopefully won’t tear. Trim the dough to 1” and crimp the top to seal. Brush with egg mixture. Cut 4 slits into the top of the pastry (or if your pastry tore like mine did, no need to do so). Bake 30 minutes until the pastry is golden brown.